Lacecap group. 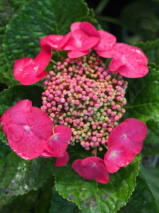 Dense multi-stemmed shrub with lush mid-green leaves, bold and saucer-shaped. In summer large flattened flower heads with rosy red or purplish starlike flowers arranged in a single row on the outside, surrounding the small yellowish-pink fertile flowers. Stunning. These form on two year old wood. Thin out crowded stems in late winter, shorten where necessary. Hardy for cold sites. Best in semi-shade, with good soil moisture.